Mag Fung leads a six-week holistic workshop on creating the body you want. Feb 5 (Thursdays), 7pm-9.15pm, Shakti Healing Circle, 3/F Waga Commercial Centre, 99 Wellington St, Central, HK$1,800 (US$230). It took almost 5 months, including plenty of public outcry and petitioning and promotion by the Concern Group for Hong Kong Science Education, but finally the Education Bureau has been made to make clear its stance on the teaching of evolution. This development was reported in an article placed in the Education section of the South China Morning Post (see below). No doubt there will be another "wave" of irrational protests and emotional letters of appeal from Cretinists and IDiots in Hong Kong, but for now they have clearly been told to "Stay Out Of Science" by the Education Bureau and by reasonable and rational people. The Education Bureau has announced that creationism and intelligent design will form no part of the senior secondary biology curriculum. The move has been hailed as a victory by leading scientists at the University of Hong Kong, who in February called for curriculum guidance on evolution to be upgraded to reflect current scientific thinking. The four scientists, who include dean of science Sun Kwok and science faculty board chairman David Dudgeon, accused the bureau of encouraging schools to promote creationism in biology lessons through the guidelines. The Concern Group for Hong Kong Science Education, which is lobbying for changes to the guidelines, has also welcomed the paper but says it does not go far enough. The calls were prompted by a clause in the biology guide, which comes into force in September, that states: "In addition to Darwin's theory, students are encouraged to explore other explanations for evolution and the origins of life." The bureau's paper was drawn up for the Legislative Council's education panel, after the Concern Group called for a panel debate on the issue. The panel demanded a report from the bureau and postponed a decision on the debate. Last month, the row intensified when the "group of 64" mounted a counter-offensive calling for the clause to be retained. The bureau's paper points out that the curriculum aims to strengthen students' understanding of scientific inquiry in biology and its links with technology, society and the environment. "In the topic `Evolution', the emphasis is put on Darwin's Theory, as it is currently the most widely accepted scientific theory on evolution," it states. "Students are expected to understand the process and mechanism of evolution based on Darwin's Theory. Students should recognise that biological knowledge and theories are developed through observations, hypotheses, experimentations and analyses and [be] aware of the dynamic nature of biological knowledge." The paper also states: "In the biology curriculum framework, creationism or intelligent design, which was mentioned in the recent submissions to the Legislative Council panel on education concerning the biology curriculum, is not included. In addition to Darwin's Theory, students are encouraged to explore other explanations on evolution such as that of Jean-Baptiste Lamarck and Sir Alfred Russel Wallace." It stresses that non-scientific explanations are not included. Professor Dudgeon said: "The bureau has recognised that the Darwinian theory of evolution constitutes the core of modern biology and that intelligent design and creationism have no place in the modern science curriculum. "It is a victory for the students and it will help to ensure that our science teaching remains world class. Clearly this guidance needs to be circulated to all secondary schools before the next semester." Concern Group founder Virginia Yue Wai-sin, said the paper only partially met demands in its petition for action by the bureau. "It is moving in the right direction," she said. "They have excluded creationism and intelligent design from the curriculum and they also emphasise scientific methods in greater detail. Yet they have just failed to take the critical step of saying that intelligent design and creationism are not science. We will continue to pursue answers to these questions with the bureau." The "group of 64", which includes 40 academics and seven teachers, argued that there was no universally accepted definition of science. But spokesman Stephen Tsui Kwok-wing, a molecular biologist at Chinese University, said yesterday: "We accept and respect the clarification of the biology curriculum guidelines from the Education Bureau. We reiterate that the purpose of our letter was not to promote the teaching of creationism or intelligent design in secondary schools." However, "group of 64" member Chris Beling, an associate professor in HKU's physics department, said: "The EDB's response has many good points but its tacit approval of Darwin's theory, which has so many blatant errors, is not commendable. "Understandably, Bible-based creationism is not to be taught as science, but it is regrettable that intelligent design is lumped in the same basket, seeing it has all the characteristics of good science. Fortunately, these are only guidelines and we live in a free society." An Education Bureau spokeswoman said the paper was based on the 138-page biology curriculum and assessment guide for the new senior secondary curriculum and its interpretation demanded a "holistic" understanding of the guide. Cyd Ho Sau-lan, chairwoman of Legco's education panel, said: "I find paragraph five enough to tell the stance of the administration. It says very clearly that intelligent design or creationism is not included." She hoped the debate was now over. "I don't think the panel is in a position to engage itself in a debate between theologians and scientists. It could be an endless one," she said. Chapman To Man-chak, bad boy comedian, Hong Kong (marrying long-time girlfriend Crystal Tin Yue-lai, 2005). There was a hilarious attempt (below) by a supporter of the Noah’s Ark myth to explain how Life on Earth arose from the “survivors of a great global flood” who were apparently cajoled into a wooden ark that had a storage capacity equivalent to 522 railway stock cars. The letter writer’s use (or abuse?) of biblical maths gives a whole new meaning to the term Imaginary Numbers. I think it is far easier to understand Complex Numbers, rather than trying to wrap my head around the rubbish churned out by Christians trying to explain their fairy tales. The replies (also below) easily trump the "Biblical Maths" letter by being clever, even funnier and much more sincere. I would be happy to help Ian Stones ("Ark attack", May 31) with his mathematical and philosophical (not scientific) problem of accepting the biblical account of the Flood. On the 10 million species: most present-day species stem from interbreeding within a genus (that is, the animal "kinds" spoken of in the Bible). Instead of 10 million, Mr Stones should take a more scientific figure of around 8,000 genera. This equals 16,000- plus animals, considering two of each kind were taken onto the ark. Biblical dimensions of the ark give a volume of 43,200 cubic metres (the equivalent of 522 railway stock cars). It was not necessary for the animals to be fully grown when they entered the ark, and their median size would have been that of a rat. Indeed, research suggests only 11 per cent of the animals would have been larger than a sheep. Obviously the ark was of a sufficient size to contain 16,000 animals and enough food for them. How long does it take for introduced species to spread throughout a new territory? Much less time than you'd be willing to allow, Mr Stones. I hope the above offers Mr Stones an explanation of some simple biblical maths. Ian Stones' letter ("Ark attack", May 31) serves to bring into focus a matter that is being debated in Hong Kong's theological and academic circles - whether Darwinism or creationism (the belief that God created the universe) should be included in Hong Kong's public school science curriculum. This debate has raged for years, especially in the United States, and one thing is certain: these two concepts cannot coexist in one system as they are totally incompatible. Creationists are almost certainly theists in their orientation and hold that intelligent design, a euphemism for God, is responsible for the whole of creation, or at least the important parts. However, Darwinists hold that it is solely Charles Darwin's theory of evolution that creates the living world as we see it today. This matter is so important to me because I would want my child to be educated on the basis, at least so far as science is concerned, of scientific fact and evidence, and not in any way influenced by biblical mythologies. What I do not want to see is any furtherance of any of these misinformed ideas of seemingly benign religious zealots, moving stealthily along a path that will lead to a situation where we are all expected to believe that there are fairies at the bottom of our gardens. Intelligent design is a misnomer for prejudicial ignorance and archaic superstition. Gordon Arthur's letter ("Biblical maths explains how it happened", June 7) in reply to my letter ("Art attack", May 31) deserves applause for its creativity. All cultures have wonderful creation stories such as the Hindu Brahma trinity. Mr Arthur takes literally, the Hebrew story that God disliked the humans he had created, so except for the family of one 600-year-old man, he drowned the lot. Despite all the genetic evidence, Aztecs, Eskimos, Africans, Indians and Chinese are all supposed to be descended from that old Hebrew. To try to explain the rich diversity of life we see in every habitat around the world, Mr Arthur redefines the concept of biological genus and claims baby ancestors of all plants, animals and fungi were crammed on a supertanker-sized boat for nine months. It should be obvious why this kind of myth needs to be kept out of science classes. Concerning the "Great Flood", could Gordon Arthur ("Biblical maths explains how it was possible", June 7) please explain how kangaroos got to Australia from Mount Ararat? Since they can neither fly nor swim, they must have gone overland through modern-day Iraq, Iran, Pakistan, India, Myanmar, Thailand, Malaysia, Indonesia and Papua New Guinea, a distance of some 14,000km. Given that the last 5,000km are made up of thousands of islands, is he suggesting that they "hopped" across? And where are the kangaroo colonies that one would expect to find along the way? Perhaps he could also explain how kiwis (New Zealand), rheas (South America), bison (North America), and giant tortoises (Galapagos Islands) came to their indigenous locations? Renee Claire and Rosina Maria Arquati lead meditation and channelling. Feb 3 (Tuesdays), 7.15pm-9pm, New Age Shop, 7 Old Bailey St, SoHo, HK$150 (US$19). Two more letters to the editor (below), again supporting reason, science and evidence. It should be clear to the Education Bureau (at least) that there are rational people in Hong Kong who care about the proper teaching of science. I have been following the ongoing debate on the teaching of science and creationism in Hong Kong with interest. The teaching of intelligent design, now referred to as creationism, has no place in a classroom. We currently have no proof that an intelligent entity created the entire universe. The various arguments put forward by creationists to justify their belief are based on half-baked criticism of the well researched and proven theory of evolution. They provide no hard testable scientific evidence to support their claims. Creationism is therefore not a scientific theory at all. If creationism is not science, should we be teaching it in a science class? I think not. Firstly, a science class is for teaching science and how science impinges on our daily lives. It is not in the business of giving religious beliefs air time. Secondly, there is no debate to be had, as creationism is not science. Thirdly, to accept creationism into the science class opens the doors to any religious idea independent of any scientific proof. Not only that but, whatever creationist story you choose, you run the risk of offending someone of a different faith. These three points alone should be sufficient to exclude creationism from a science class. I am writing in response to two recent cases our group (Concern Group of Hong Kong Science Education) encountered regarding the new secondary biology curriculum. Our group submitted a paper to the Legislative Council on April 16, urging for clarification from the Education Bureau regarding the statement that is the cause of the current row over creationism. The article "Creationism row hots up as objectors fight" ( Education Post , May 15) mentioned a paper by a group of more than 60 educators, scientists and professionals - dubbed the Creationist 64 - which was sent to the Legco panel. The article argued that creationism was an acceptable topic for inclusion in the biology syllabus. Recently we learned of another similar submission to Legco by a University of Hong Kong associate professor, Dr Pauline Chiu. In contrast to our group's transparent approach, these submissions to Legco are not available on the Legco website. 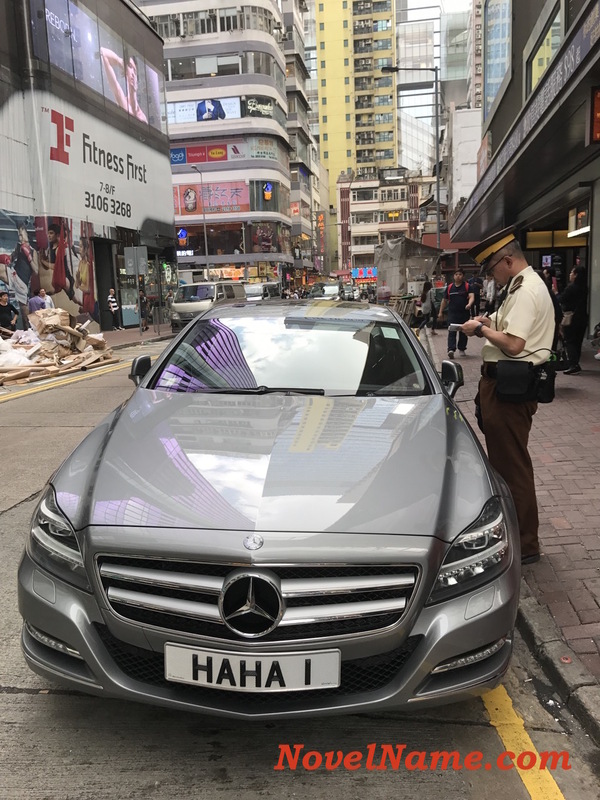 As a result, the public has no idea who is approaching Legco about this controversial issue, or what their viewpoints are. Our group was able to obtain the documents and, to our dismay, we found that both submissions contained misleading information aimed at undermining science. They also contained propaganda concerning creationism and/or intelligent design, ideas which have been debunked (a fact not acknowledged in the paper), and repeated attempts to dilute science to allow supernatural ideas such as intelligent design to be taught in science classes. * Attempts to avoid public criticism by preventing the public from seeing their views and their identity. Our group, by comparison, is transparent: our submissions are available for public view and critique; moreover we can be found on Facebook. * Undermines the definition of science and even avoids mentioning it to allow supernatural ideas be "smuggled" into the science class. * Failing to be open about their true position and agenda as creationists or proponents of intelligent design - the "Creationist 64" used almost exclusively creationist/intelligent design propaganda but did not reveal that fact in the papers to Legco and the Education Bureau. * Not revealing themselves as Christians, who are bound to oppose evolution and support creationism/intelligent design because of their personal beliefs. We respect Christians and their belief in divine creation by a deity but we strongly oppose their attempt to smuggle personal and religious beliefs into the science classroom and call it science. To influence legislators and officials in the Education Bureau by such acts is not what we expect in a democratic society such as Hong Kong, especially from "educators, scientists and professionals". It is unfair in a public debate to hide true opinions from public scrutiny. We have also issued rebuttals to their papers which are also available on either the Legco website or on our site. Victor Geronimo leads a four-part Yuen healing method study group. Feb 3, 13, Mar 10, 31, 7pm-9pm, Balance Health, 27/F, 3-5 Arbuthnot Rd, Central, HK$300/class (US$37). I mentioned before that I consider Hong Kong Disneyland to be up there as “Hong Kong’s most hilarious theme park”, along with the Noah’s Ark zone. The Disneyland management team is certainly doing its utmost to maintain my low opinion of them! We should perhaps be grateful that the Noah’s Ark management team led by lawyer Moses Cheng is not yet up to speed, seemingly lacking business experience in spotting the opportunity to exploit Hong Kong kids who are on early leave. But give them time, I suppose. Their ultimate goal is after all (like Disneyland) to brainwash young minds to their own worldview. Hong Kong Disneyland has come under fire from medical chiefs for offering primary school children unlimited visits for a special price during their enforced holidays. From noon today until the end of the month, primary school children will be able to make as many visits as they like for just HK$250. A spokeswoman said Disneyland's special offer is in response to the two-week suspension of classes and to help children fill in the time. However, the offer runs against the advice of Secretary for Education Michael Suen Ming-yeung who, in announcing school closures, also told parents to exercise discretion when taking their children to public areas. 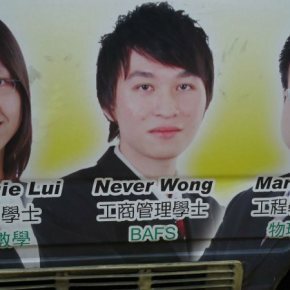 Health chief York Chow Yat-ngok was more direct. "We have told Disney they should not use this moment to promote businesses. Our decision to suspend classes is to let the children stay at home instead of going out for fun. Children should try to stay home as much as possible," Chow said. "Should they go out, they should avoid places which are crowded. If parents decide to take their children to playgrounds, they should be sure their children are healthy without symptoms. "However, [Disney] should not give people any incentive [to bring their children there] - we have made our stance very clear to Disney." The special offer has also attracted the ire of Hong Kong Medical Association chairman Tse Hung-hing. "[Disney] is not responding to what is being proposed by the government. This is not going to help in the prevention of the spread of swine flu," Tse said. He said the company is "not acting properly" but stopped short of calling the move irresponsible saying it is not responsible for public health. A Disney spokeswoman said the promotion would go ahead as planned. The theme park's 400-member hygiene team would guarantee cleanliness and touch- screen surfaces and exhibits will be sanitized every half an hour. Guests will be required to fill in health declaration forms. She said a theme park survey found 98 percent of respondents satisfied with hygiene conditions. A spokeswoman for Ocean Park said it has no plans for any school closure promotions. However, the park will heighten its hygiene alert and there will be health stations where voluntary temperature tests, free masks and alcohol hand sanitizers will be available. Hong Kong Disneyland was accused of putting business interests ahead of public safety yesterday after it seemed to flout a government health measure by launching a ticket promotion for young children, who are at risk of spreading swine flu. Targeting kindergarten, primary and special-needs schools in Hong Kong, the promotion offers unlimited visits to the theme park from today until June 30 for just HK$250. This is the usual price for one-day admission for children between three and 11 years old. The government has closed such schools for two weeks in a bid to contain swine flu. "We have already informed Disney that it should not make use of this opportunity to do such a promotion," Secretary for Food and Health York Chow Yat-ngok said. "Closing the schools does not mean that they are on holiday and can go outside and play. As I have said, they should try to stay at home. If they go out, they should avoid crowded places." A Hong Kong Disneyland spokesman said the tickets would go on sale today. "Hong Kong Disneyland Resort has many open areas planted with over a million trees, which allow guests to enjoy fresh air," he said. "The safety of our guests and cast members is always our top priority." But Hong Kong Medical Association president Tse Hung-hing said the promotion was "improper" and went against government policy. "There are a lot of opportunities for indirect contact at the theme park, like holding on to handrails, taking a seat on a ride, queuing up and using utensils. Also, not all areas are open, so this argument is simply not sound," he said. "And what do trees have to do with human swine flu? Having trees does not mean you are free of it." Democratic lawmaker Fred Li Wah-ming called on the government to halt the promotion and warned of dire consequences if people became infected with swine flu at the park. Education Secretary Michael Suen Ming-yeung said: "The whole point of suspending classes is to ensure that there is no congregation of young children, as very often it is not easy for them to look after themselves or to take care of their own personal hygiene. We should make sure that there is no congregation of young children in large numbers. "So my advice to parents is that they should try as far as possible not to bring their children to places where there are large numbers of children, such as playgrounds and shopping malls." Shubhraji leads a workshop on the healing power of mantras. Jan 31, 10am-3pm, New Age Shop, 7 Old Bailey St, SoHo, HK$1,300 (US$162). As any good archaeologist or scientist knows, digging deeper (i.e. "raiding") to uncover more details of the bigger picture is what drives us to a deeper understanding of 42. 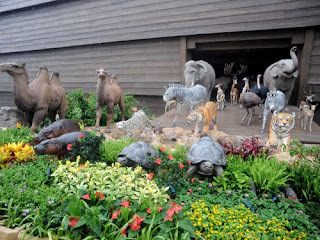 Hong Kong's newest "attraction" is Noah's Ark. It will be interesting to uncover exactly why this kind of "theme park" was proposed by Sun Hung Kei Properties and ultimately given the green light by the government. It is no coincidence that many who propagate the Noah's Ark myth as history are creationists who claim that intelligent design is science. Their claims lack evidence and collapse when they are asked to explain some simple mathematics. First, how much wood and labour would be required to build a wooden boat 4,000 years ago, big enough to accommodate 10 million species? Second, how many hundreds of thousands of tonnes would be stored for 40 days' worth of food, including fresh meat and prey for the carnivores? Third, how long would it take for these 10 million species to propagate to all the different islands and continental environments they occupy today? If the Ark's maths fails, then would we allow our children to be taught the "intelligent design" version of creationism - that the millions of species we see around the globe today were designed and suddenly put in place after the flood? Alfresco Dining in Public Spaces To Be Axed. A Lone Dissenting Voice? In just one week since the Central and Western District Council decided to ban all restaurants from using or renting public spaces, there have been 12 (yes, twelve) letters in the SCMP condemning the “ridiculous” decision. I won’t post all 12 letters on this blog (unless there are requests to do so). However I will post 1 other letter (see below), this time a dissenting voice that appears positively overjoyed by the District Council’s ban. This letter writer is a well known local activist (e.g. campaigns for tough anti-smoking laws, tackling noise pollution on public transport, and preserving the city's shorelines). She may have a point, but first where is the evidence to support her "conspiratorial" views? Should rules on open space be more flexible? I applaud Central and Western District Council for shutting down the polluting, smoking, outdoor dining venues on public open space, the same way they had the courage to do for all public parks in their district ("Alfresco dining in public spaces across Central and Western off the menu from July", May 21). In Stanley, where alfresco is synonymous with "polluted by tobacco smoke", I routinely see men laughing while holding their lit, smoking cigars right next to the faces of little children who are walking by. It is perverse. The restaurant lobby does not want "vibrancy". It wants, triad-like, to take control of our public property, sell liquor to smokers and the public be damned. On keeping with the Star Trek theme (that occasionally pops up on this blog), here's some Star Trivia about Star Trek and Chinese influences. 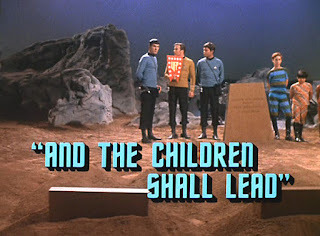 Apparently, Tsing Tao beer left a memorable impression on Gene Roddenberry, and on others who worked with him, as evidenced by these screen shots of a Star Trek: The Original Series episode called: "And the Children Shall Lead". Check out the Asian kid (1st on right). In this story, his dad has been buried along with the other adult colonists. 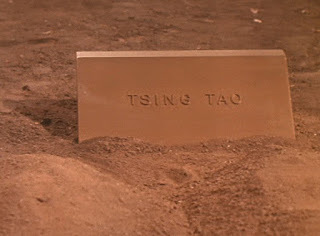 I may be mistaken, but I believe the Asian kid's family name is "Tao".